With comprehensive business applications, RS3614xs+ offers enterprises seeking uninterrupted service a reliable, superior-performance network attached storage solution, helping you to simplify data management, optimize virtualization environments, and rapidly expand storage capacity. 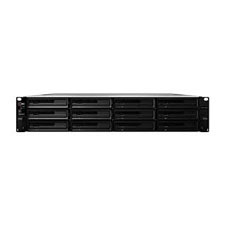 RS3614xs+ delivers stunning performance at over 3,600 MB/s throughput and 361,469 IOPS under RAID 5 configuration.1RS3614xs+ is equipped with 8GB RAM and up to 32GB ECC RAM expansion support, so enterprises can guarantee data accuracy as well as superior performance. RS3614xs+ is equipped with an encryption engine which offloads encryption calculation tasks away from the main CPU. Thus, the CPU can be free for other important tasks. In addition, Advanced Encryption Standard (AES) on shared folders with hardware acceleration ensures security without compromising access performance, providing over 3,458.88MB/s in reading. With 12 HDD trays and support for adding up to two Synology RX1214/RX1214RP2 expansion units, RS3614xs+ provides the ability to seamlessly expand up to 216TB3 of total storage capacity and expand a single volume up to 108TB on the fly. When the storage capacity of RS3614xs+ nears it limit, expansion is easily accomplished as it supports up to 36 HDDs or SSDs. RS3614xs+ provides enterprises flexible capacity and balanced performance to meet the needs of varying applications and processes. In addition to the default four Gigabit ports, RS3614xs+ comes with dual PCI Express Gen3 x8 slots, allowing installation of dual 10GbE Network Interface Cards (NIC) for maximized bandwidth. Dual PCIe slots for quad 10GbE ports support brings you the superior performance that data-intensive applications demand of your storage system. Coming with native SATA III 6Gb/s support, RS3614xs+ ensures the optimum data process under heavy system loading. RS3614XS+ comes with comprehensive redundancy mechanisms to ensure your business continuity. Built-in four LAN ports with failover provides the reliable redundancy in the event of unexpected network failure. The high reliability system design including fan-less CPU heat-sink and passive cooling technologies prevents single point of failure. Other features such as redundant data paths, power supplies, system fans, and network ports with failover support ensure continual service uptime. RS3614xs+ enables the combination of hard drives and read/write-optimized SSD cache, boosting throughput efficiently while minimizing cost per gigabyte. With full SSD cache reading and writing support, RS3614xs+ offers a significant reduction in I/O latency without crippling your budget. With only a small upfront investment, businesses can benefit from significant server performance enhancement. Synology RS3614xs+ is backed with Synology’s 5-year limited warranty. With technical support and hardware replacement service, the five-year warranty maximizes your enterprises’ return on investment. For the entire duration, you will enjoy technical support via e-mail and telephone.